Prescot Dig - How do I become an archaeologist? Sara, one of the site archaeologists, at work. The best place to start is to find out as much as you can about archaeology in your area, and from the Internet, and read as many books as you can on the subject. Visit as many museums and archaeological sites as possible, and try and work out what interests you and what your personal strengths are – if you are good at science, you may wish to study environmental archaeology, for example. Think about what subject you enjoy doing most at school and explore how you can use your skills in archaeology. If you are aged 8 – 16, you could join the Young Archaeologists Club. To become an archaeologist you will need a degree in archaeology. 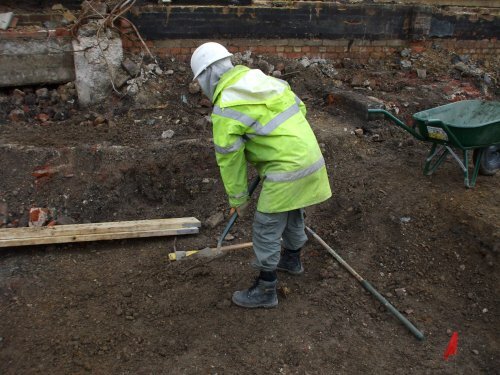 There are many universities in Britain that teach archaeology, and you can find a link to course information through the British Archaeological Jobs Resource. If you intend to spend anytime working as a field archaeologist, it is advisable to get as much experience as possible before you enter the workplace. You will be expected to do some field work during your degree, but bear in mind that if you want to work as a field archaeologist when you graduate, most archaeology companies are looking for people with at least six months experience! You can find out more about getting more experience through the Council for British Archaeology web site, which has links to training digs and volunteer positions in the UK and abroad. You can also find out about volunteer projects all over the world from Past Horizons. It should also be pointed out that archaeology is notoriously badly paid as a graduate profession – don’t expect to become rich!